A "chokepoint reaction" is defined as a reaction that either consumes a unique substrate or produces a unique product. A chokepoint analysis provides a systematic method of identifying novel potential drug targets. We have a long standing interest in metaboliv chokepoints targets for developing anthelminthics. Hence, chokepoint enzymes were identified in the genomes of 10 nematode species, and the intersection and union of all chokepoint enzymes were found. By studying and experimentally testing available compounds known to target proteins orthologous to nematode chokepoint proteins in public databases, this study uncovers features of chokepoints that make them successful drug targets. Chemogenomic screening was performed on drug-like compounds from public drug databases to find existing compounds that target homologs of nematode chokepoints. The compounds were prioritized based on chemical properties frequently found in successful drugs and were experimentally tested using Caenorhabditis elegans. Several drugs that are already known anthelmintic drugs and novel candidate targets were identified. Seven of the compounds were tested in Caenorhabditis elegans and three yielded a detrimental phenotype. One of these three drug-like compounds, Perhexiline, also yielded a deleterious effect in Haemonchus contortus and Onchocerca lienalis, two nematodes with divergent forms of parasitism. Perhexiline, known to affect the fatty acid oxidation pathway in mammals, caused a reduction in oxygen consumption rates in C. elegans and genome-wide gene expression profiles provided an additional confirmation of its mode of action. Computational modeling of Perhexiline and its target provided structural insights regarding its binding mode and specificity. 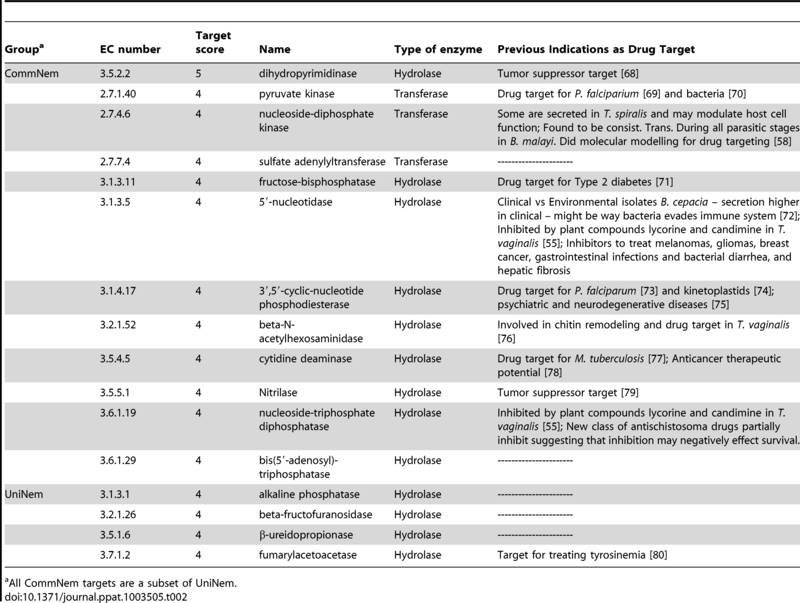 Our lists of prioritized drug targets and drug-like compounds have potential to expedite the discovery of new anthelmintic drugs with broad-spectrum efficacy. Taylor CM, Wang Q, Rosa BA, et al. Discovery of Anthelmintic Drug Targets and Drugs Using Chokepoints in Nematode Metabolic Pathways. McKerrow J, ed. PLoS Pathogens. 2013;9(8):e1003505. doi:10.1371/journal.ppat.1003505.